Hi there! This is the last day of the blog hop and I’m sharing one of my favorite cards from the release. I used Ant’s Pants and the Sun & Clouds die to put together this scene in the pop up box card. It also features one of my childhood fascinations …. an ANT FARM! For this card, it’s a little more detailed so thankfully I have a video to go along with it! The link and supply list is listed at the very end of this post. Remember to check out the other design team members’ blogs and comment for a chance to win prizes! We have TWO new paperpads bursting of colors, with awesome patterns all ready for your projects called You Are My Sunshine (from TLC Crafting) and Sweet Summer! There are FIVE clear stamp sets that are oh-so-sweet: Shore Lucky, Lemonade, Ants Pants, A New Beginning and Heatwave (two sets from Cre8tive Cre8tions)! But wait, you’re about to die for… FIVE new die sets that can be used as accessories or full backgrounds: Sunburst, Scalloped Rectangle, Sun & Clouds, Surfing Waves & Sandy Beach, Waves & Clouds. And for the first time at LDRS Creative, you can grab them in bundles, because you KNOW you need them all! Today, I’m sharing a card I put together using the A New Beginning stamp set. I really like the floral images and wanted to use them for this card. First, for the background, using Flesh and Pink Tutu Hybrid Ink, I inked up an A2 card panel. I kept Flesh in the middle and Pink Tutu on the edges. Most of this will be covered up but, I still wanted to blend it nicely between the two colors. Using the Sunburst die, I die cut a piece of white paper. This particular die cuts a little smaller than an A2 panel, so the Pink Tutu ink on the edges will create a nice frame for the card. I love how the two colors are subtle but look really pretty behind this die cut panel. Second, I stamped out the image of the girl and the florals using Raven Hybrid Ink. I wanted to keep a orange and pink color theme, so I used shades of those two colors to color in these images. Once I was done, I fussy cut the images and placed them in the center of this card. It’s a super simple card, but I think it turned out to be really pretty. Whenever, I decide to give away this card, I can add the appropriate sentiment along the bottom half of the card. I really like leaving cards ready to go minus a sentiment so it can fit any occasion. Hope you enjoyed my first card for this release. Come back tomorrow for more card inspiration. Today, I’m sharing this card using Honey Bee Stamps’ Spring Blossoms stamp set to create this really pretty card. I mixed simple coloring with heat embossing on acetate to create this card. I really love flowers on cards since it adds elegance to them, especially with this set. I wanted to use a mix of different elements and I’m really happy with the end result. Hi there! I totally forgot to make a congratulatory baby card for my friend who just had a baby girl. I’ve been friends with her since high school so I wanted it to be special. I have always adored the Waffle Flower stamp set, Popping in. It’s SUPER adorable and perfect for any baby card so I had to use it to create my card. Today I’m sharing this card that I love so much! I had this idea in my head for awhile but when I went to the stamp set, I realized that the bear was actually holding the pie in his hand. I really wanted to make it so he would pop up from a window peeking at the pie. This happens a lot when I have an idea for an interactive card in my head so sometimes I just have to mask and manipulate the image a bit. Also, for this particular slider, I don’t need a slider die. I just create a channel using foam tape. Thankfully, it’s easier to show you than explain in words, so I have a video for you! Hi there! Today I’m sharing one of my favorite techniques for using the small images in stamp sets because they are often neglected but it’s so easy to use up to create a fun, colorful background. You probably have the supplies sitting around as well. All you really need is vellum, heat embossing supplies and some alcohol markers. I also created a video to go with it so you can check out all the steps in creating this card. Hello everyone! It’s been awhile since I’ve shared one of my cards and I really am loving this one. 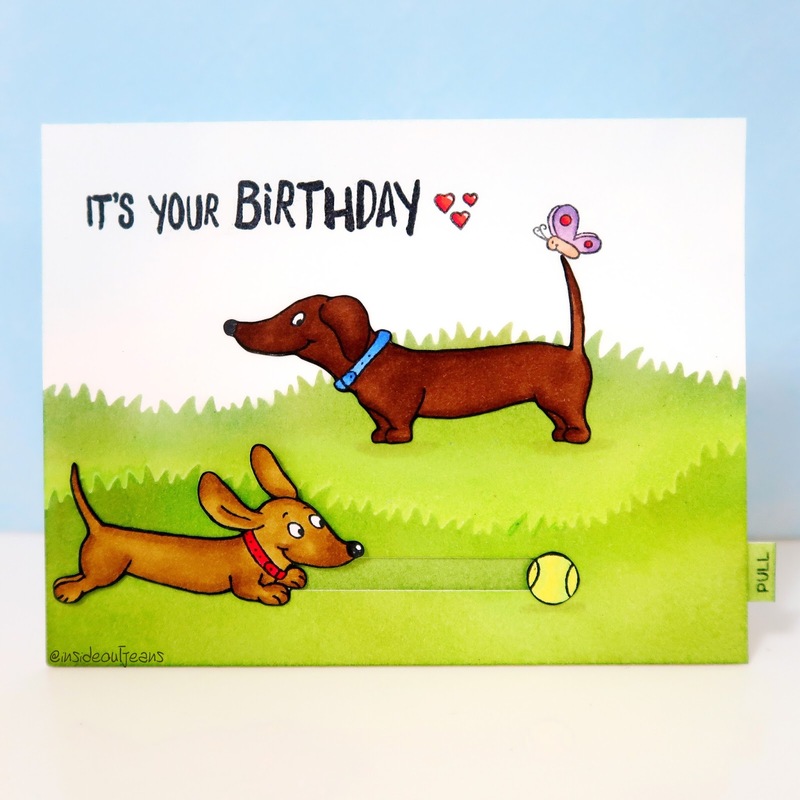 If you’re a fan of animals, especially doggies, this Dachshunds stamp set is for you! You’ll see that I used the Hoppiness stamp set as well to add a few extra elements to the card as well. I used a grassy hills die to create a stencil. Using distress inks, I colored two layers of the grass. I definitely wanted to use two of the dogs in the set. I like how the first dog is looking back. I can’t really tell if he’s looking at that butterfly on his tail or the other dog chasing the tennis ball. Since the second dog looked to be moving, I wanted to put him in action. And what dog doesn’t love chasing balls? I just had to have him chase the tennis ball included in this set. I create a pull tab channel so he could run towards the ball. 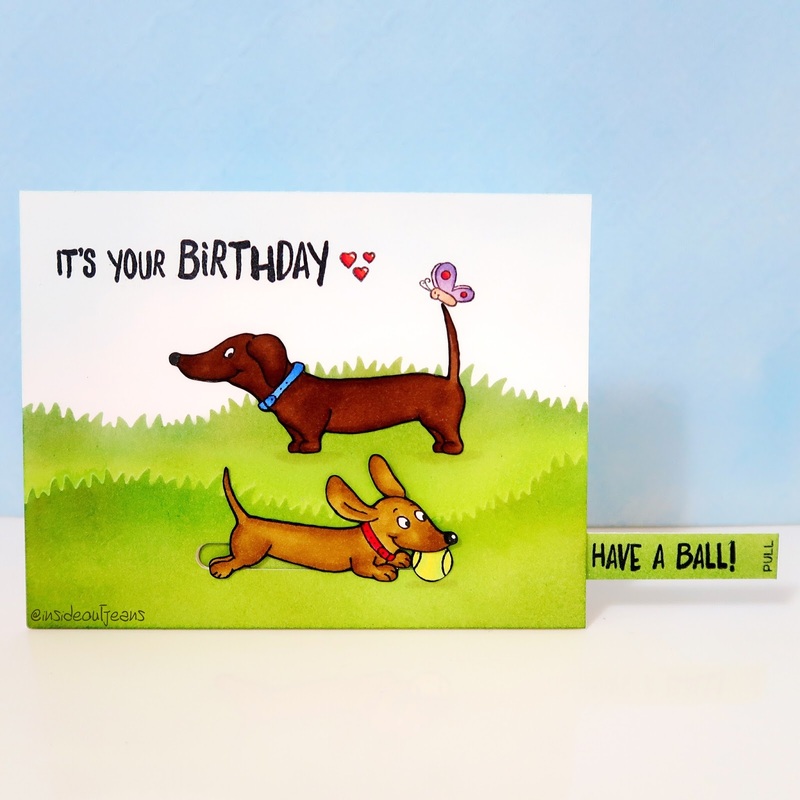 I used two sentiments in this card: It’s Your Birthday and Have A Ball. The first one is prominent on the front of the card, but the second one is hidden until the dog fetches the ball. It’s a small surprise for the card recipient. I hope you enjoyed this card and picked up the set. It’s so fun! Thanks for stopping by! Today, I’m on the Drive By Crafts‘ blog sharing this fun tri-fold card. If you wanna see how I came about creating it, check it out here. This was a pretty fun card to put together, but there’s definitely more coloring than normal! Come on back on Friday, when I share a new video and a card I had running in my head for a couple weeks… but never had the time to put it together until now.